ST. LOUIS (CNS) — Baltimore Archbishop William E. Lori paid tribute Aug. 3 to deceased members of the Knights of Columbus for their lives and example of charity and also recalled the founder of the fraternal order, Father Michael J. McGivney, for his life of devotion and service. The archbishop was the main celebrant and homilist of the Aug. 3 memorial Mass on the final day of the 135th annual international convention of the Knights of Columbus held in St. Louis. “With joy and thanksgiving, we remember the life and example of the saints and indeed all the holy ones who were members of the )fraternal) order or friends of the order,” said the archbishop, who is supreme chaplain of the Knights. He noted the closeness St. John Paul II felt to the Knights during his pontificate and also recalled the Knights of Columbus among the priests and their companions martyred during the Mexican Cristero Rebellion 1926-29. Most of the martyrs were priests executed for carrying out their ministry despite the suppression they experienced under Mexico’s anti-clerical laws. “Out of love for God’s people, he created the Knights of Columbus as an organization designed to strengthen the faith of husbands and fathers while providing for their families in time of death and bereavement,” he added. “Father McGivney’s love for the poor, the outcast, the orphan, and the widow remains the true North Star of everything the order does in service to one and in service to all,” Archbishop Lori told the Knights. Father McGivney is a candidate for sainthood. His cause now being reviewed by the Vatican, and a reported miracle of healing attributed to Father McGivney’s intercession also is being studied by the Vatican. One miracle confirmed by the Vatican is needed for beatification; in general, a second confirmed miracle is needed for canonization. “Alongside them … we provided warm winter coats for inner-city kids,” he said. “It was with these same Knights that we recognized the image of Christ in a young person competing in Special Olympics … (that) we helped families facing natural disasters, fire and the death of loved ones. 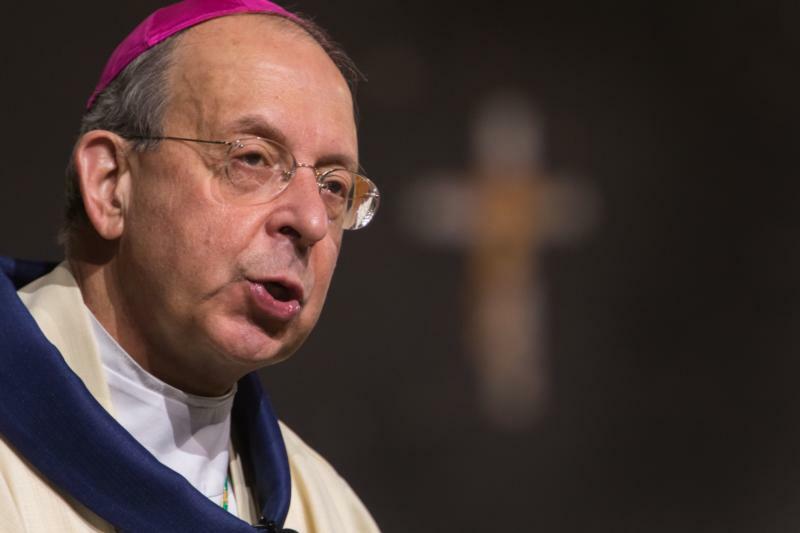 The archbishop said the day’s readings spelled out hope. In his Letter to the Romans, St. Paul “tells us hope does not disappoint — that is to say, the genuine Christian virtue of hope does not let us down,” he said. “The hope on which St. Paul staked his life and ministry is a deep-seated confidence that God loves us deeply, more deeply than we could ever imagine and that he wills our salvation –- not because he gets anything out of it but merely because he does indeed love us in a deep and incomprehensible way,” the archbishop explained. “The saints and holy ones associated with our order staked their lives on this truth,” Archbishop Lori added. At the end of Mass, Cardinal Stanislaw Dziwisz of Krakow, Poland, longtime personal secretary to St. John Paul, blessed the congregation with a relic consisting of a vial of St. John Paul II’s blood. The elaborate reliquary that holds the relic is normally housed at the St. John Paul II National Shrine in Washington, founded by the Knights in 2011.